Find out why banks, Fortune 400 companies, and family dynasties have been using 770 accounts for years. President of Perpetual Wealth Systems just released a new book; Wealth Without Stocks or Mutual Funds, that shows people many different options for their money and future. There are many alternatives to growing wealth that can work totally separate from Wall Street or in conjunction with a stock portfolio. A new book and training platform designed to help people understand many of these alternative options has just been released. 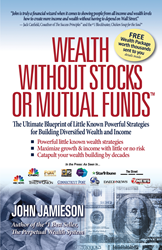 Written by financial expert and Bestselling author John Jamieson "Wealth Without Stocks or Mutual Funds" (http://www.wealthwithoutstocksormutualfunds.com) is written to be a huge resource for people looking for alternatives to Wall Street.